If you just consider the size and weight, the AR118 is super easy to carry around and use. There are so many things which can go wrong with such a tiny pressure washer but somehow AR North America has actually managed to make it so easy to use. From attaching the wands, hose connections, changing nozzles, starting it to moving it around, everything is super easy with this pressure washer. In fact, I have to say that at under $100, this is actually much easier to use than any $500 plus pressure washer. Plus, it has got all necessary attachments. So tiny, such a small induction motor and obviously zero noise. Well, it does make a little more noise than an average electric washer but that is only because of its size which does not allow the unit to mask its noise signature. Overall, it is definitely a silent machine to have around in the house. AR Blue Clean "AR118" unboxing, setup and first impressions with foam cannon! I was inclined at first to rate it as a 3/5 in terms of power but after using it for a couple of weeks, I realized that at 1,500 PSI and 1.5 GPM it is actually just as good as any $200 electric washer. Now if this is what you can get at below $100, then it definitely is powerful. If you can find any other reliable pressure washer in the market delivering more than what the AR Blue Clean AR118 can for less than $100 then call me, I would love to try that out. But, until then I am rating this as the most powerful among affordable models. Not as usable as a gas washer but this tiny washer does have its advantages. 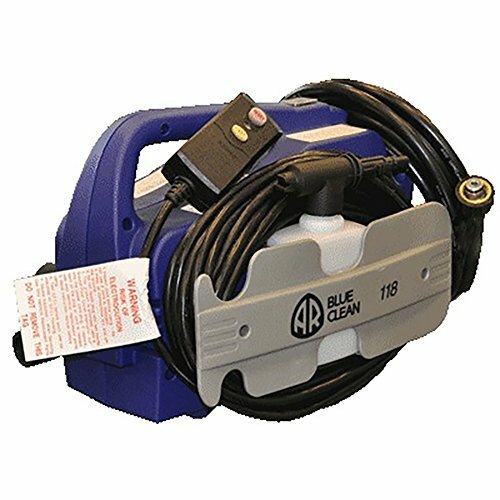 The AR Blue Clean AR118 is an awesome portable unit to have around even if you already own a large gas washer. In fact, because of its size, I would go on to say that it is an excellent gift for your mom, sister or girlfriend. Women may not find gas and larger electric washers enticing but they will love blasting dirt, grime and stains away with this tiny beauty. This is one area where I was sure the AR118 would fail miserably. I mean how can something that costs so less and delivers way above its pricing last long? From personal experience and what I have seen on review sites, this beauty actually goes on and on. It has already performed for a month with me and for others given a good 1 to 2 years of performance before dying out. At this price range, I don’t think one can ask for anything more. Just a note, the hose and the adapter area do tend to leak a bit. Also, the power cord generally does not stay tight in its storage space, so be careful of leaving it loose. This being my second AR product, I finally got a chance to test out their customer service first hand. Previously with the larger AR383, I faced no issues which would force me to contact them. Now I had a genuine issue. They forgot to ship me the garden hose connection adapter. I made a quick call to their customer department and they promised to send it over in two days time, free of cost and apologized for the inconvenience they caused. Awesome work AR! 1.50 GPM and 1,500 PSI rating. Triple axial wobble plate piston pump. Comes with 20 feet long hose and 30 feet power cord. Highly compact and portable design. Really small form factor makes it ultra-portable with a carry handle. Sufficient power for domestic tasks, very dependable too considering its cheap price tag. Totally plastic in construction with a below par hose and nozzle set. Now do not confuse my 5 out of 5 star rating for the AR Blue Clean AR118 as a clear indication to get this alone. In my opinion, for the price it retails at and the capabilities it has, this is a definite winner. Moreover, I have yet to find a decent competing model to compare the AR118 with. Hence, this pressure washer is a must have for anyone even if you already have something capable of pelting out over 2000 PSI and 2 GPM. Why drag something so heavy and large around when many home maintenance tasks can be completed with this little blue beauty.